1Lt Walter J. Carney (P) - All missions flown as First Pilot. First mission (187) flown with an experienced combat orientation CoPilot - 2Lt William G. Moyer on his 31st combat mission. Mission 251 flown as First Pilot with the 2Lt Charles D. Haynes crew on their first combat mission. Completed 37 dispatched (36 credited) mission combat tour on 9 December 1944 (Mission 284). 2Lt James H. Hickey (CP) - Flew on all of the 1Lt Carney missions except for 6 missions (187, 251, 268, 274, 283, 284). Flew on three missions as CoPilot with other Pilots (245, 274(LC), 285(LC). Upgraded from CoPilot to Pilot on orders dated 5 December 1944. Flew on one mission as First Pilot (284). Completed 35 mission combat tour on 11 December 1944 (Mission 285) and was transferred to fly P-51 fighters with the 360th FS/356th FG at Martlesham-Heath, England and flew 16 P-51 combat missions from 11 March to 18 April 1945. Sgt Jackson L. Henderson (WG) - Flew on one mission with the 1Lt Carney crew (190). Deleted from crew when crew size was changed from 10 to 9 men. Flew on no other 303rd BG(H) combat missions. Other crewmen: All missions flown with 1Lt Carney except as noted below. Additional missions flown with other Pilots as indicated below. All completed their 35 mission combat tours. Mission 204, 16 July 1944, to Munich, Germany in B-17G 42-97284 Ain't Misbehaven (359BS) BN-S. B-17 was badly damaged over Munich. 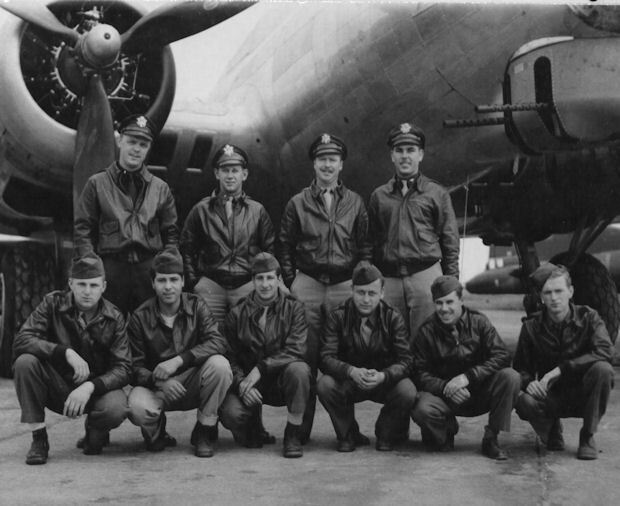 Lt Carney was able to fly his B-17 to an airfield at Galera, Italy. The B-17 was transferred to the 301st BG(H), 15th AF at Lucera, Italy on 22 July 1944. Lt Carney received letters of commendation from L/Gen Spaatz, James H. Doolittle and M/Gen Robert C. Williams for a job well done by a combat Pilot. L/Gen Spaatz wrote: "The fact that you have shown expert airmanship and a great deal of determination in bringing your badly damaged aircraft across the Alps and to a friendly base in Italy has been brought to my attention. I wish to commend you for this display of perseverance in saving valuable government property and personnel. Such an example is indicative of a high state of morale and will be an inspiration to other combat crews finding themselves in similar circumstances." Substitute crewmen on mission 204 was Sgt Raymond Tartaglia (Tog) for 2Lt Thomas E. Cooney (N). Mission 259, 18 October 1944, to Cologne, Germany in B-17G 42-102484 Heller's Angel (359BS) BN-K. Was one of five 303rd BG(H) B-17s to land in continental Europe. Lt Carney landed in Brussels, Belgium.